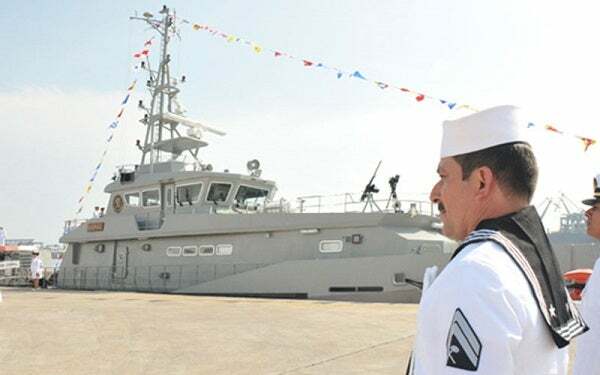 ARM Palenque (PC-333), the third patrol vessel in the Ténochtitlan-class, was launched in March 2014. Image courtesy of Secretaría de Marina. The seventh vessel, ARM Tulum (PC-337), was launched in February 2016. Image courtesy of Secretaría de Marina. The Ténochtitlan-class coastal patrol vessels are being built for the Mexican Navy. Image courtesy of Secretaría de Marina. The sixth vessel, ARM Tajin (PC-336), was launched in June 2015. Image courtesy of Secretaría de Marina. The Ténochtitlan-class vessels feature a slender hull. Image courtesy of Secretaría de Marina. The Mexican Navy (Secretaria de Marina) ordered a total of ten Ténochtitlan-class patrol vessels, as of January 2016. The vessels are based on Damen Shipyards Group’s Stan Patrol 4207 design. Damen was contracted by the Mexican Navy to provide design, engineering, material package, technical assistance and crew training for the Ténochtitlan-class patrol vessels, which are being built by the Mexican Navy’s ASTIMAR 1 (Astillero de Marina Numero 1) shipyard in Tampico on the coast of the Gulf of Mexico. "The Mexican Navy signed contracts with Damen Shipyards Group for the next three vessels in January 2016." The vessels are intended to perform patrol duties, surveillance, search-and-rescue, maritime security, interdiction and deterrence, and combat against illegal activities in Mexico’s economic exclusive zone (EEZ) and coastal areas. Construction on the first two coastal patrol vessels, designated ARM Tenochtitlan (PC-331) and ARM Teotihuacan (PC-332), began in 2011 and deliveries were completed to the Mexican Navy in 2012. Damen Shipyards Group received a contract from the Mexican Navy in May 2013 to provide design and material package of Stan Patrol 4207, as well as technical assistance for the third patrol vessel in the class, ARM Palenque (PC-333). Launching ceremony of the vessel took place in March 2014. Contract for the fourth vessel, ARM Mitla (PC-334), was signed in August 2013 and the launch was held in May 2014. The next three vessels were ordered in November 2013, April 2014 and August 2014 respectively. Designated ARM Uxmal (PC-335), the fifth vessel was launched in March 2015, followed by the sixth, ARM Tajin (PC-336), in June 2015. The launching ceremony of the seventh vessel, ARM Tulum (PC-337), was held in February 2016. The Mexican Navy signed contracts with Damen Shipyards Group for the next three vessels in January 2016 and their launch is expected to take place in the same year. The Stan Patrol 4207 vessels are also in service with the coastguards of Jamaica, the Netherlands, Vietnam, Barbados, Bulgaria, Canada and Albania. The 42.8m-long, 7.11m-wide Ténochtitlan Class patrol vessels feature long and slender hull, made from steel. The superstructure is built using aluminium alloys to reduce the vessel’s centre of gravity. The vessel has a depth of 3.77m at sides, a maximum draught of 2.52m and a displacement of 239t. It can carry 30m³ of fuel oil, 6.4m³ of fresh water, 8.4m³ of waste water, and 1.2m³ of dirty oil/bilge water. It is installed with a 325,000 BTU air conditioning unit. The main deck is fitted with 196kg high-holding power anchor equipment, 140m U2 anchor chain, electrically driven anchor winch, and Heila HLM 3-2 S crane. Life-saving equipment carried by the vessel include four life buoys, two life rafts to accommodate 20 people each, lifejackets, water and foam-based fire-fighting systems, and hand-operated fire extinguishers. A 7.5m rigid inflatable boat (RIB), which has a speed of 35k, is carried on the ramp at the rear to transport troops. The coastal patrol vessel can accommodate up to 18 personnel. The main deck has three cabins for one commander and three officers, and houses ship office, mess, stores and galley. The lower deck is equipped with six cabins for crew members. The Ténochtitlan-class is armed with two 0.50 calibre machine guns. Navigation for the ship is provided by GPS / DGPS, two 1,000W, 230V searchlights, gyrocompass, magnetic compass, marine radar, echo sounder and automatic identification system (AIS). The onboard intercom and loudhailers facilitate communication between the troops. The vessel also features a CCTV system and GMDSS A3 standard external communication devices. The Ténochtitlan-class is equipped with two Caterpillar 3516C HD or MTU 16V4000 engines and requires a total power ranging between 4,000bkW and 6,000bkW. The propulsion unit also incorporates two Reintjes/ZF gearboxes. The vessel is fitted with two controllable pitch propellers, two rudders and one 75kW hydraulic bow thruster for providing slow-speed manoeuvring. The engine room is equipped with a fixed fire-fighting system with Novec 1230. The maximum speed of the patrol vessel varies between 25k and 30k. The vessel can travel up to a range of 700nm at the maximum speed, and the range can be increased to 2,000nm when sailing at a speed between 10k and 14k. It can stay afloat for up to 14 days. This project forms part of our recent analysis and forecasts of the global Naval Surface Combatants & Warfare Systems market available from our business information platform Strategic Defence Intelligence. For more information click here or contact us: EMEA: +44 20 7936 6783; Americas: +1 415 439 4914; Asia Pacific: +61 2 9947 9709 or via email. Pompe Garbarino, an Italian company founded in 1932, is a leading manufacturer of centrifugal and positive displacement navy pumps, and pumps for the shipbuilding industry. EID is one of the leading high-tech companies in Portugal, with a proven record and solid know-how in the fields of electronics, communications and software engineering. EID's integrated communications control system fetures a full integration of all internal and external communications resources, including remote functions.